Instrumenting Xbox One app takes only a few easy steps. At this point you should have configured Xbox One in your Suitest account. Suitest supports UWP apps for Windows 10 Creators Update SDK (Build 15063) or newer written in C# and XAML. Apps created in C++, Visual Basic and XAML should work as well but we do not guarantee full support. Install Suitest instrumentation library for Xbox One directly from your Visual Studio through NuGet package manager. 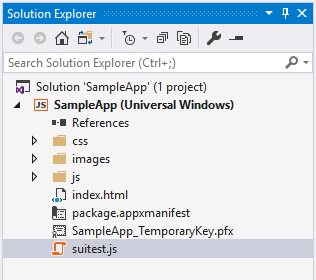 Call Suitest.Initialize() from OnLaunched method in the App.xaml.cs file. In Visual Studio, navigate to your apps project manifest (Package.appxmanifest) then select the Capabilities tab, and check Internet (Client). Create a dedicated configuration for building your app with the instrumentation library enabled. Important: If you have Xbox One with OS version 10.0.17763.2023 please skip to this version's specific section. Copy and paste the code snippet from the Suitest configuration page into every HTML file of your application. For best results put it as the first script element in your HTML file right after the opening tag. For apps hosted on HTTPS replace http with https in the code snippet. Whitelist ms-appx-web:/// or app's domain name if your app is hosted. Set WinRT Access to All. Upload the created ZIP file to Suitest at the app configuration page. Suitest will automatically install or update the package on the device as necessary when you try running the app on this device. It is important to exclude the Suitest instrumentation library from your production build but to keep it in the instrumented build that you are going to upload to Suitest. Create a new configuration in the Configuration Manager and copy the settings from your "Release" configuration. Change the name of the copied configuration to "Suitest" (or to any other name you like). Open project properties and on the Build tab select "Suitest" in the Configuration field. Then append ;SUITEST to the contents of Conditional compilation symbols field. Unload project (right click project name in Solution Explorer and choose Unload Project). Save and close the .csproj file and reload the project (right click on the project name and select Reload Project). After you have done this only builds created with the Suitest configuration will contain the instrumentation library. All other builds will be completely clean of the instrumentation code. Insert the file into your Visual Studio project folder. In properties of the suitest.js file change the property Package Action so that it is set to Content. Insert the following snippet into every HTML page which you would like to test. The snippet assumes that the file suitest.js is place in the root folder of your project, if that is not the case please correct the path in src.